This past week we celebrated Thanksgiving holiday with family and friends before we headed out to play our 62nd show of our Learning To Fly Tour 2018 at the Empress Theater in Vallejo. We hit the home stretch starting in December as we kick it off with a bang in Petaluma this weekend. More details along with other exciting show announcements including New Years Eve below! “An Evening with …” celebrating an entire night of TOM PETTY. This is one of our most popular shows of the year and always among the best that we do. Get your tickets NOW as this show is expected to sell out in advance. We will be giving away a limited edition collectible poster while supplies last at the end of the night! SATURDAY 12/15 – Hopmonk Tavern in Novato. This will be a special holiday show in this fun and intimate venue. Tickets are on sale and available now so get yours while you still can as this show will sell out in advance. For the 2nd year in a row we’re headed back up to North Shore Lake Tahoe two days after Christmas for another great show in the “Red Room”. This is a great live music venue. 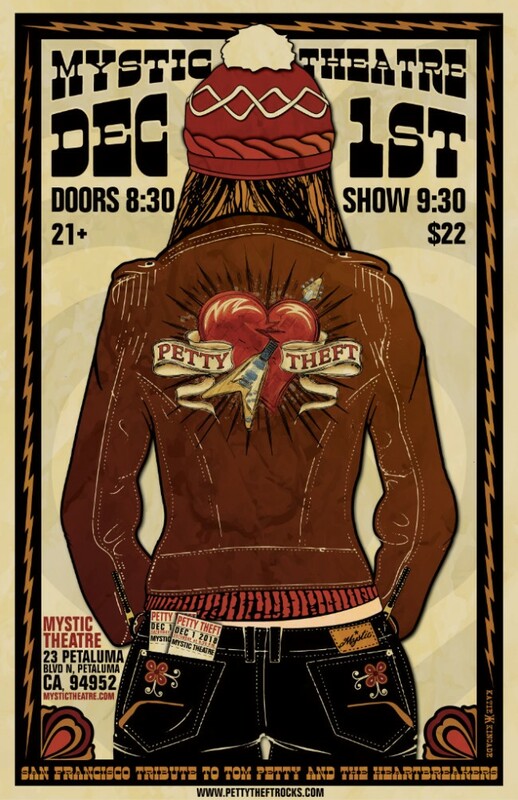 Come up to Tahoe and rock some Petty with us! MONDAY 12/31 “NEW YEARS EVE 2018 BASH” at the Mill Valley Community Center! Time to celebrate the end of the year with our final show of 2018 as we return to this venue where we performed a sold out NYE show four years ago. Tickets are on-sale NOW with both GA and limited Special VIP Table reservations (including Champagne) available. Party favors, drinks, a DJ for the earlier portion of the evening and a balloon drop along with all of your favorite Tom Petty classics to make this a great evening. JOIN US! SATURDAY 1/19/2019 – Catalyst Club in Santa Cruz, CA. This venue is hallowed ground for us as it is the only venue we have played where Tom Petty & The Heartbreakers actually performed (in 1977 on their first headline tour). This will be another great night and will feature two sets. (No opener). Come to Santa Cruz and JOIN US! Tickets are on sale and available NOW! FRIDAY 1/18/2019 – The Showbox in Seattle, WA. We are excited to be returning to this great city in the North West at this fantastic venue supporting our long time friends in SUPER DIAMOND (Tribute to Neil Diamond). Tell your family and friends to come see us! That’s right, we are headed back to Utah! We are looking forward to performing at both of these great venues for the weekend. Last time for our debut we sold out both shows so grab your tickets early!